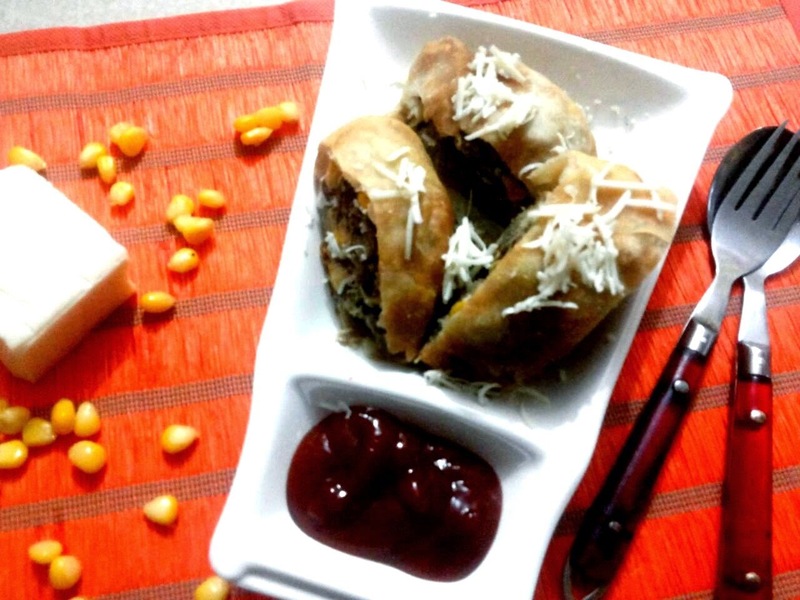 Some ingredients are such that they adapt any cuisine and are loved by most of the people.Mushroom and Corn are two of those versatile ingredients.This recipe is even better because it is eggless and baked.These puffs are yummilicious starters!! Take a bowl,add flour ,salt and butter in it.Mix well.Knead it with cold water till you get a hard dough. Wrap this dough in an aluminium foil and let it rest in Fridge. Thaw the corns either in oven or in pressure cooker.Finely chop the soaked mushrooms. Take oil in a pan.Add thawed corns and mushrooms to it. Cook over high heat ,stirring occasionally(for 3 minutes). Add cheese slices,salt,black pepper to the above mix.Stir again for one minute. Take a ball of size of fist of puff dough.With the help of rolling pin,make a thin sheet of it,approx size is 20 cm X 20 cm. Place the ready stuffing on one side of sheet. Now roll the side with stuffing till you get the shape of a compact log. Seal the edges with the help of butter.Place the puff on a greased baking tray. Preheat the oven at 180 degree Celsius and place the puff for 30 minutes. After 30 minutes,remove puff from oven and slice it diagonally in three pieces. Serve puffs with tomato ketchup and enjoy!